NOTICE: Activation key must be used on a valid Steam account, requires internet connection. 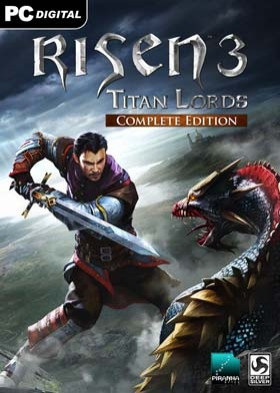 COMPLETE EDITION	Include: Risen 3 - Titan Lords Risen 3 - Adventure Garb Risen 3 - Fog Island Risen 3 - Uprising of the Little GuysABOUT THE GAME	The world has been abandoned by its gods and is scarred from the rampage of the Titans. Humanity is struggling to regain strength and rally its forces.… You, however, have more pressing concerns: your own life has been shattered and you must set off to reclaim what is lost amidst the darkness that is spreading throughout the world. Who knows, maybe you'll even save the world at the same time? Three threads of destiny lie before you. Three ways to rise up against the Titans and regain your soul. Which path to take? The choice is yours. KEY FEATURES Freedom: Freely explore and take on quests at your leisure. Quests will have different ways to tackle them and different outcomes. You can play different parts of the game in whatever order you wish and shape your character individually. Exploration: Discover quests and characters as you make your way through the diverse world of Risen 3 - Titan Lords. From quaint medieval-style towns to delving deep into the dank dark of mines, to the supernatural shadow world, there is a wealth of possibilities waiting to be explored. You will be able to traverse this world in a variety of ways, from swimming to climbing. Enhanced combat: Featuring a revamped fighting system, with new animation systems in place that add nuance to the fights. Magic is back! Crystal magic has returned, bringing with it devastating new combat abilities. Wield elements such as lightning, fire and ice to obliterate your foes, or make use of a multitude of additional magical skills to aid you in exploration - the choice is yours! Guilds & factions: Choose to ally yourself with one of three distinct guilds, each offering unique skills, armouries and quests allowing you to approach your quest in very different ways. Discover additional factions that exist to bend the balance of political power in the world, each with their own agenda for you to uncover. Be careful which characters you trust – some might ally with you with the intent of fulfilling their own sinister plans.SYSTEM REQUIREMENTS Minimum OS: Windows Vista SP2, Windows 7 SP1, Windows 8 Processor: 2.4 GHz Dual Core Processor Memory: 2 GB RAM VRAM: 512 MB Graphic card: Radeon HD 3850 or GeForce 9600 GT Sound: DirectX 9.0c compatible 8GB Hard Drive Space Recommended: OS: Windows 7 (64-bit), Windows 8 (64-bit) Processor: Intel Core i5 at 2.5 GHz or better or AMD Phenom II x4 940 at 3.0 GHz Memory: 4 GB RAM Vram: 512MB Graphics: Nvidia GeForce GTX 470 or AMD Radeon HD 5850 Sound: DirectX 9.0c compatible 8GB Hard Drive Space	© 2014 by Koch Media GmbH, Gewerbegebiet 1, 6604 Höfen, Austria. Deep Silver is a division of Koch Media GmbH. Developed by Piranha Bytes, Deep Silver and their respective logos are trademarks of Koch Media. All other trademarks, logos and copyrights are property of their respective owners. All rights reserved. Microsoft, Xbox, Xbox 360, and the Xbox logos are trademarks of the Microsoft group of companies and are used under license from Microsoft. PlayStation and the PS Family logo are registered trademarks and PS3 is a trademark of Sony Computer Entertainment Inc. The PlayStation Network Logo is a service mark of Sony Computer Entertainment Inc. All other marks and trademarks are the property of their respective owners. All rights reserved.